Brasov is a small medieval city in the fabled Transylvania region of central Romania. Located 160km from Bucharest, the country’s capital, Brasov is widely considered to be the second most important city in Romania. The welcoming red-roofed city is located in the Southern Carpathians, the second highest group of mountains in the Carpathian Mountain range, making it an ideal place for outdoor enthusiasts that enjoy hiking and skiing. Though often overshadowed by the world famous ski resorts in the European Alps, the Carpathians are scattered with terrific ski hills and alpine villages, attracting visitors from all over the globe. With vampires being all the rage in mainstream entertainment these days, it’s no surprise that Brasov and Transylvania have enjoyed a surge in tourism traffic. Located about 15 miles outside of Brasov, perched high on a hilltop overlooking the ageless town of Bran, is the home of the world’s most famous vampire – the legendary Count Dracula Castle. Obviously you can visit the popular city year round, but the best times to visit are either in the summer or winter (it is conveniently located near Poiana Brasov, a world class ski resort). 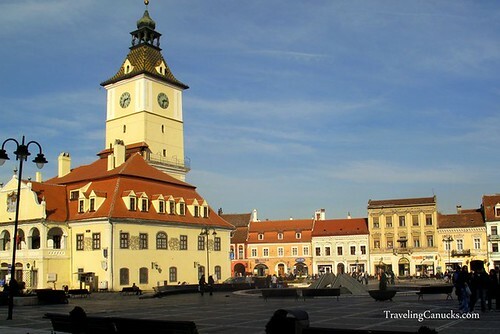 WHAT to see and do in Brasov? Aside from its endless outdoor activities and enchanting Transylvanian countryside, Brasov is famous for it close proximity to the iconic Bran Castle. The picturesque red-roofed medieval castle is one of the most celebrated and visited landmarks in Romania. Equally impressive is Peles Castle, located in the neighbouring town of Sinaia in Prahova county. The region is also home to hundreds of historical Saxon churches and fortifications built between the 13th and 15th centuries, seven of which have been designated as UNESCO World Heritage Sites. The list includes the Transylvanian Fortresses of Biertan, Calnic, Darjiu, Prejmer, Saschiz, Valea Viilor, and Viscri. 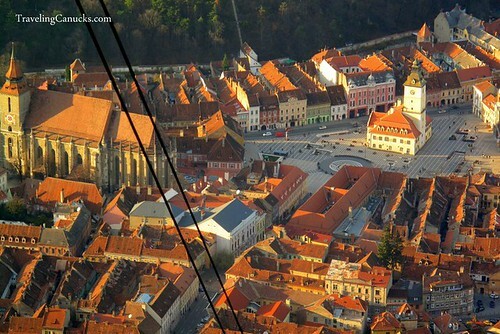 For the best views of Brasov, take the tram to the top of Mount Tampa. The panorama photo below was taken from inside the Mount Tampa tram. If you’re the energetic type you can also hike to the top of Mount Tampa by taking the well-marked hiking trails. You can also hike to the massive ‘BRASOV’ sign that overlooks the city (Brasov’s smaller version of the ‘Hollywood’ sign). The best way to travel around Romania is by train. The train system is quite good, with several daily trips between Brasov and Bucharest. You can also catch an overnight train from Brasov to Budapest, Hungary, where you can easily connect to other Western European cities. Transportation in Brasov is decent (though not the most punctual), making it easy to explore its beautiful countryside. As one of Romania’s most popular tourist destinations, travelers will notice several tour packages to Bran Castle and the neighbouring Transylvania Fortresses. If you’re the budget concious adventurous type, skip the tour and tackle the sightseeing circuit by using local transit. Most hostels and hotels can hook you up with bus routes and schedules. Be careful when taking taxis in Romania and Eastern Europe. It’s not a question of “IF” a taxi driver will try to rip you off, it’s “WHEN”. One thing that we learned (after getting ripped off) is that most taxis will display its rates (base fee, price per km and/or price per hour) on the outside of the vehicle. First, have your hotel, restaurant or a trusted local person call for the taxi. Avoid flagging a taxi from the street (especially with your camera visibly hanging around your neck!). Second, make sure you confirm with the driver that the rates on the door are accurate. Third, keep an eye on the meter to make sure it’s working properly. Have you visited Brasov? How about Romania? Care you share your travel tips and experiences in the comments section below? Great write up guys, I’d love to get to Romania before I leave Europe. Those photos of yours are stunning. Thanks Chris! Romania is a cool country. It’s all about the countryside towns and villages. So many incredible castles and fortresses. Bucharest is not a pretty city but it’s very interesting. Hopefully you’ll get a chance to make it out there! Great tips on an interesting city in Romania. 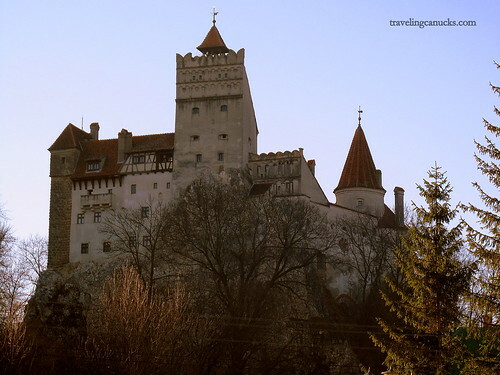 Seeing Transylvania is a must for me. Romania is a place I really want to visit. After visiting parts of Eastern Europe, I now have the desire to explore more including Bulgaria and Romania. Budapest is one of my favorite cities in Europe and after reading your post, I am even more intrigued with Romania. I love Budapest also – such a cool city. The Parliament Building is incredible! Did you do any of the baths in Budapest? The Szechenyi Bath had a beautiful building and a unique experience! By the way, I have done a couple of posts on Hungary for Europe A La Carte and will follow up my Hungary post from last week with another one this week. Hungry and Romania are on our Europe bucket list and we hope to get there sooner rather than later. Thanks for all the advice and tips! Romania has a different feel about it, it’s not quite Europe but yet still European. Our only regret is that we didn’t have enough time to explore more of the countryside. Renting a vehicle is a good option if you’ve got the time. Wow, this is an awesome series! I just learned so much more about Romania! Thanks guys! Excellent! Our hope is that we shed some light on the lesser known cities of the world. Love the idea behind this series guys. Very cool. This place looks amazing, and your pictures are spectacular, especially the overhead view of the castle. Just awesome! I’ll be looking forward to reading more from this series. That looks like a totally awesome place to visit. Thanks for sharing the fabulous pics and tips. I hope we make it there … someday. 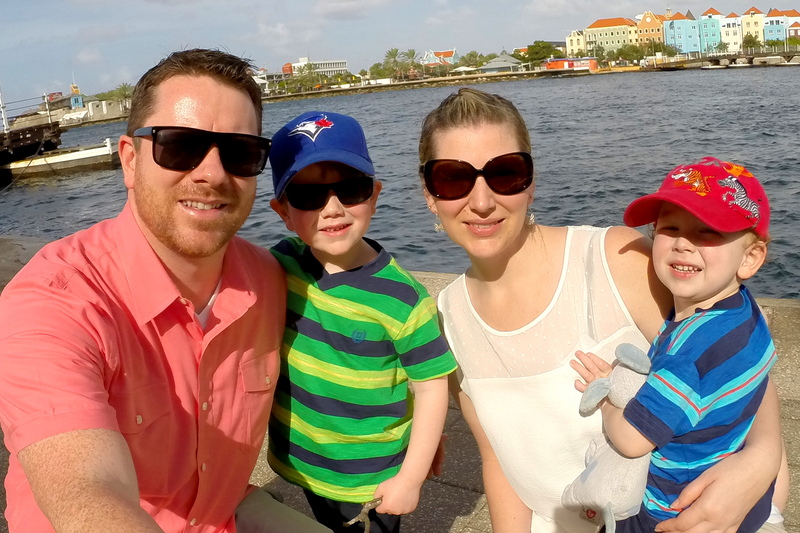 We didn’t really know what to expect when we arrived – it definitely exceeded our expectations! The views from Mount Tampa were quite stunning, we couldn’t help but envision what life must have been like 200 hundred years ago! Looks like I may have to add this to my list of places to see. I had never thought about skiing in Romania! 🙂 Great photos! I really like your “where, why, when, what, how” format! Romania has always been on my radar, I just haven’t made it there yet. In that aerial shot, are those black lines from a gondola to the mountaintop? Very beautiful photos! Yes – the lines are the cable from the tram. This shot was taken about 2/3 of the way up the mountain from inside the car. Romania has never been on my bucket list but there are gems in any country. I once won a bike ride through Romania and Bulgaria (via the Tour d’Afrique folks who also run a Paris to Istanbul ride) but couldn’t go. That’s still how I would want to see the countryside. Is there any place you guys haven’t been? Bike ride through the countryside would be amazing. Lots of mountains though, so you’d need to be in shape! Romania is not somewhere that ever really appealed to us but after reading your inspiring post it has been added to our list of places we would love to go. Keep up the great work! Glad to hear that this post has inspired you to consider Romania! It is often overlooked, but offers a unique European experience. It’s a cool castle. Tight secret passageways and stone staircases, and most of the original furniture remains inside. Great write up! Anyone wishing to stay, doesn’t have to use a hostel. You can get apartments from 20e per night, which is only 10e more than sharing a room with 10 others, so, if you are able to splash out, its worth the extra. Especially when you factor dining into the mix, whcih can be done for 5e per pperson easily, with wine. See trip-advisor tor the best places, but my top tip would be Transilvania Restaurant, on Castelului street – its the locals favorite & half the price of most of the others. Anyone needing help with accom, just look us up if you are struggling, http://www.whitemountain.ro & we can point you at the cheap sources, or the better hotels if required. Thanks for the feedback and extra tips. I’ve just discovered your article about Brasov and wanted to congratulate you for the great content you provided there. 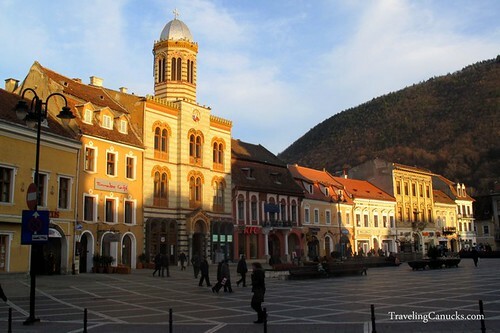 Romania is my home country, actually and, naturally, I have visited Brasov and the surrounding areas several times before – the Carpathian resorts are the most popular places with the tourists in Romania. By the way, you took some great photos in Brasov – love them all! Great tips about the taxi! I haven’t been to Romania yet but have been dreaming of it ever since I was a little girl. 🙂 Hopefully one day soon! Yeah, the taxis in Eastern Europe are some of the worst in the world. At least when you get ripped off in India or SE Asia it’s only for a couple dollars. In Romanina and Bulgaria it was like $20, sometimes more!! SO SO happy to see Eastern Europe getting more attention from travelers now! It’s really the best time to visit as it’s now completely crowded with tourists but I can see it changing soon! We would add some tasty restaurants to your well-written post. One can have great food at Bella Muzica, located right in the main square, right next to the Carturesti book shop. Try the goulash soup or the stew. If you want something Romanian then try the food from Sergiana, located close to the Aro Palace Hotel. You did such a nice presentation for Brasov, you clearly liked your time spent there. If you ever visit it again, you should also visit other Transylvanian cities and villages as well. You’ll feel like in a fairtytale.